Adult - Child Size - SHIPS FREE! 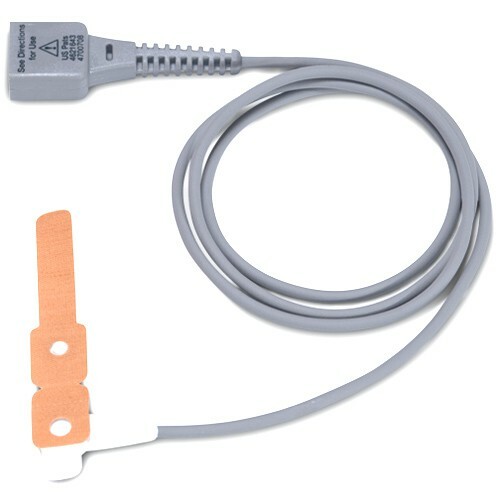 The Oxiband Adult/Neonatal Sensor, by Physio-Control, is an oxygen sensor that is made to be used with monitoring equipment or defibrillators or other medical devices. This particular sensor is reusable but makes use of a disposable adhesive bandage wrap that is used to hold the sensor in place on the patient's finger or toe. The sensor is designed to plug in to a monitoring system such as the Nellcor Bedside SpO2 Patient Monitor or the Connex Vital Signs Monitor. The device is made from high quality plastic, rubber and wiring in order to stand up to the rigorous demands of regular use. The disposable wraps are designed hold the device firmly to one of the patient's appendages allowing it to continuously monitor their pulse and oxygen saturation levels. Because the wraps can be made to fit various sizes of fingers, this sensor can be easily used with adults or children. Sp02 sensors, or pulse oximeters, function by transmitting red and infrared light through an appendage and determining how much of it is able to pass through the blood. The amount of red light that is absorbed is then compared it to the amount of infrared light that is absorbed. The ratio obtained from these two levels determines the oxygen saturation of the blood.